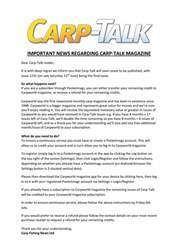 This week’s issue of Carp-Talk (issue 1039) is available to download now. 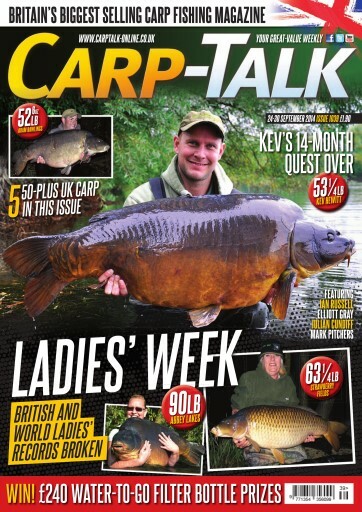 In one of the best weeks of big-carp catches ever, we have five 50lb-plus UK carp within the pages of this issue, including a new UK ladies’ record for Leanne Jaynes at 63¼lb. 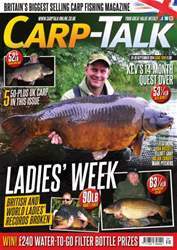 We look back at a fantastic final of the British Carp Angling Championships at RK Leisure’s Wraysbury No. 1. 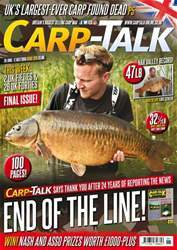 Julian Cundiff explains why he thinks the big autumn feed-up is a thing of the past, and Mark Pitchers talks about the benefits of matching the hatch. Elliott Gray has a rig that is perfect for your autumn boilie-fishing campaign, and Ian Russell reflects on a memorable 24 hours he and one of his students had during a tutorial. In “Trade Talk”, Ben Wales looks at the products on show during the Wychwood trade show at Barston Lakes. 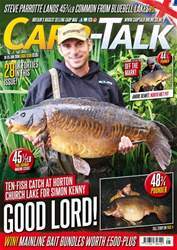 The Fox-Mainline Carp Angler of the Year competition continues, the Gardner monthly winners are announced, and there is £240-plus of Water-to-Go products to give away.